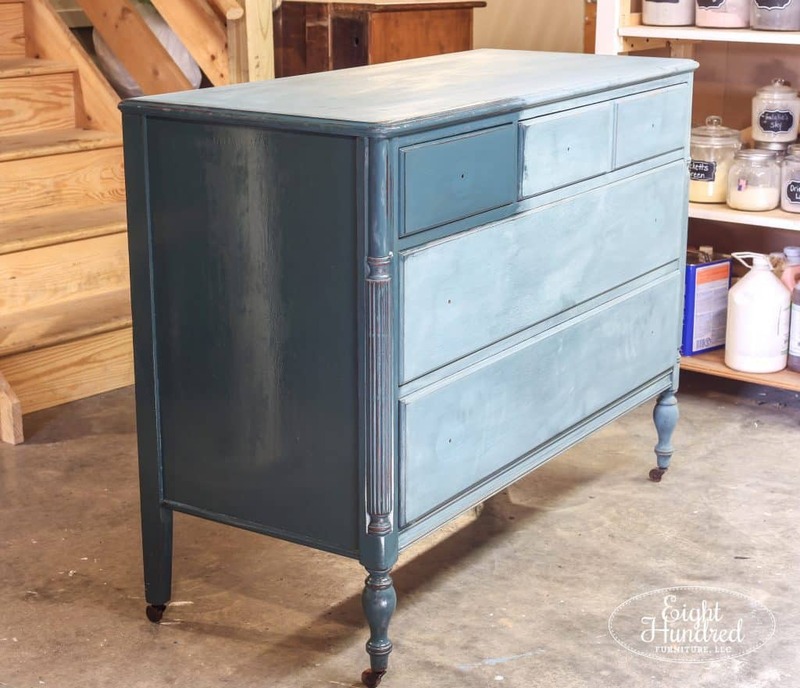 Painting with Miss Mustard Seed’s Milk Paint can be a bit of an adventure. 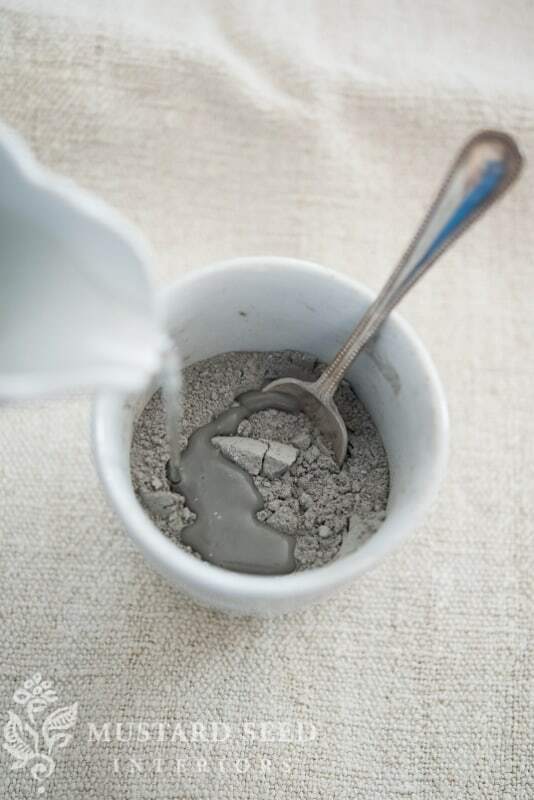 For starters, the paint comes in powdered form and is mixed with water. 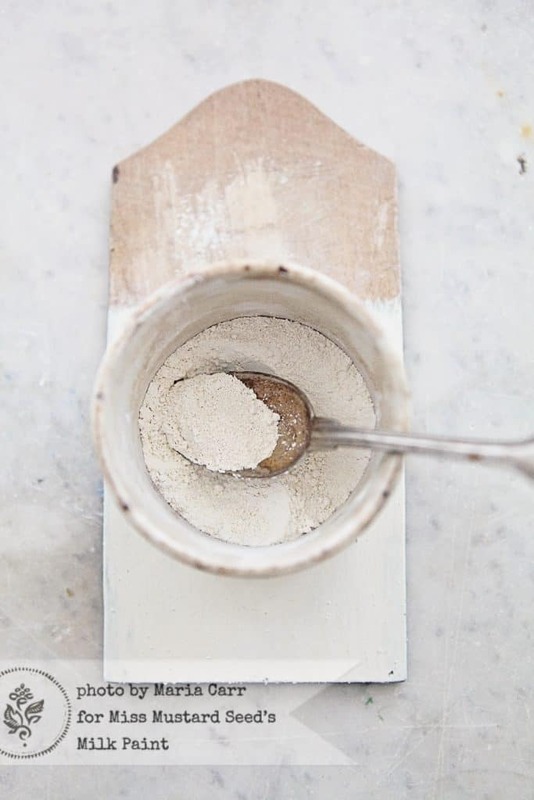 It has five simple ingredients, which makes it very different from other paints on the market. Its primitive and old world nature make for an experience unlike any other. 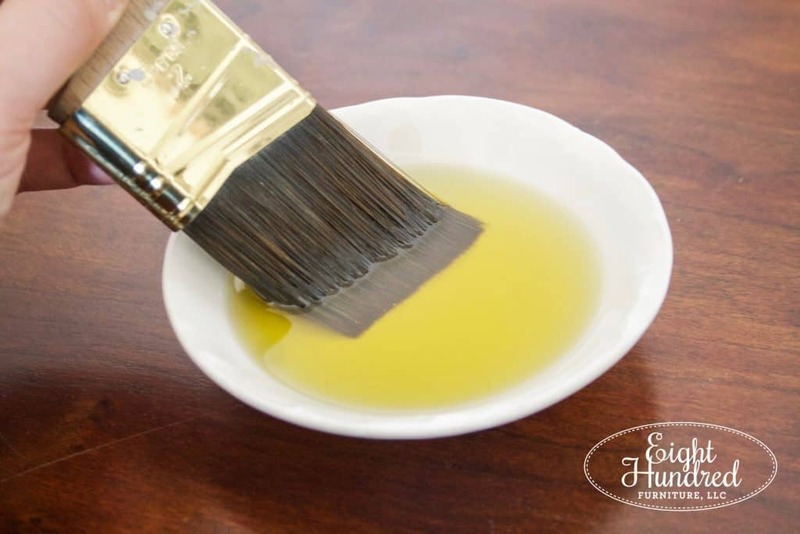 When it’s used over raw wood, it soaks in like a stain and gives you incredible vibrant color while preserving the wood grain. 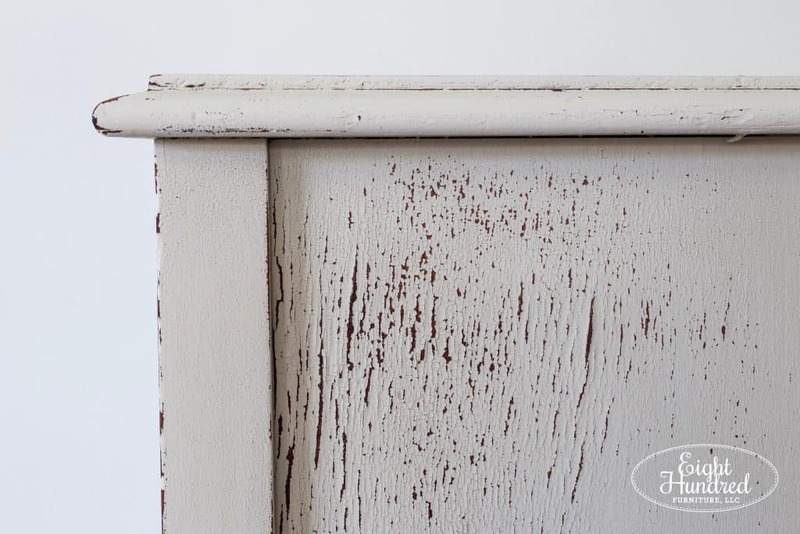 When it’s painted onto a surface with an existing finish, it randomly resists in places and can chip in a charming fashion. That’s what happened on one side of my Grain Sack nightstand, but I didn’t mind! 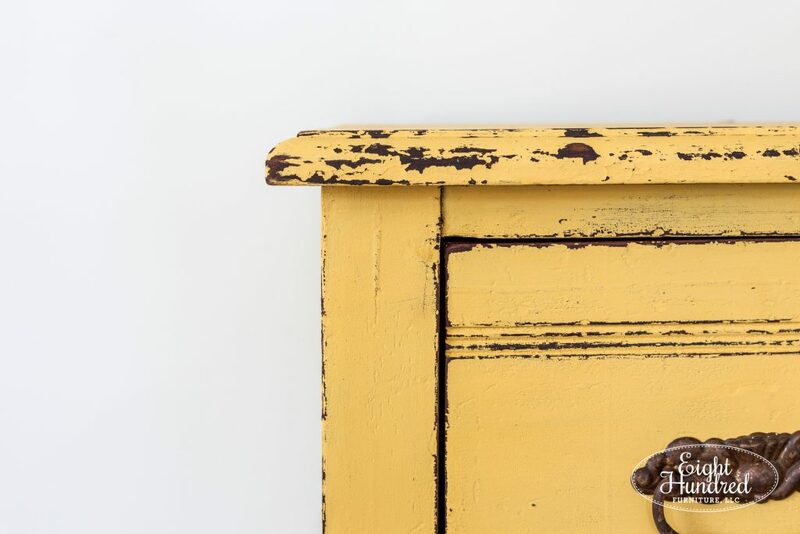 I also loved how milk paint chipped on my Mustard Seed Yellow dresser too. Its unpredictable and random nature make it very exciting and fun to work with, as long as you let it do its thing and embrace what it wants to do on your piece. It’s also important to see your project all the way through to the end. 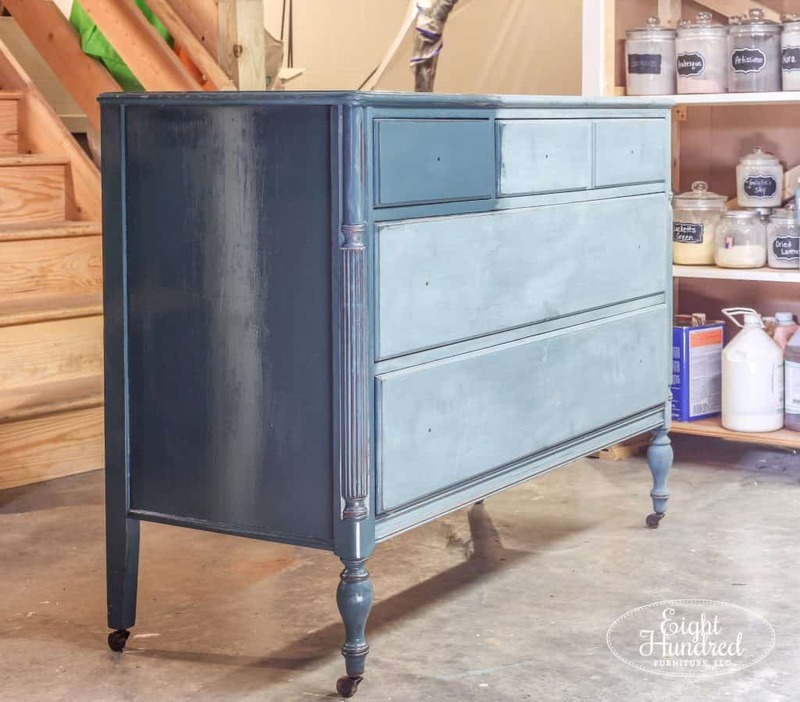 Miss Mustard Seed’s Milk Paint is thinner than modern paints, so when you paint the first coat on, it can look streaky and uneven. Sometimes the color may even throw you for a bit of a loop too when you first paint it out. 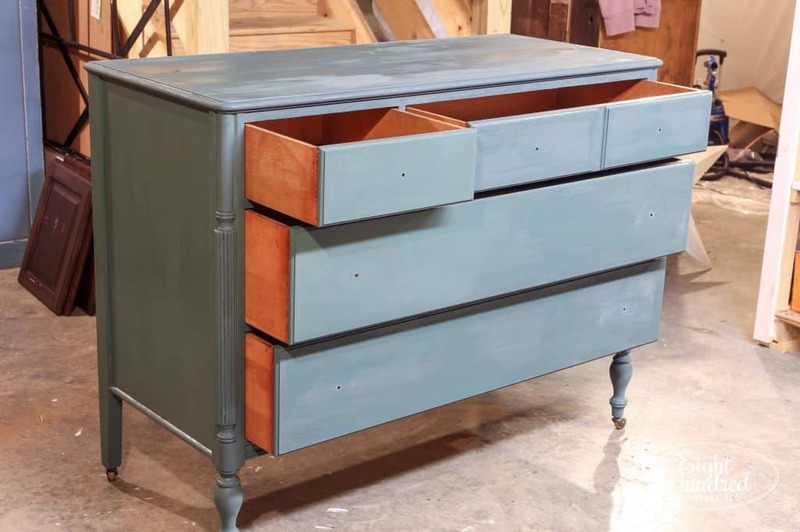 I’ve heard Miss Mustard Seed say that abandoning a MMS Milk Paint project halfway through is like leaving the hair salon with foils still in your hair! No one would leave the salon looking like that because the hair dresser isn’t finished with the process yet. 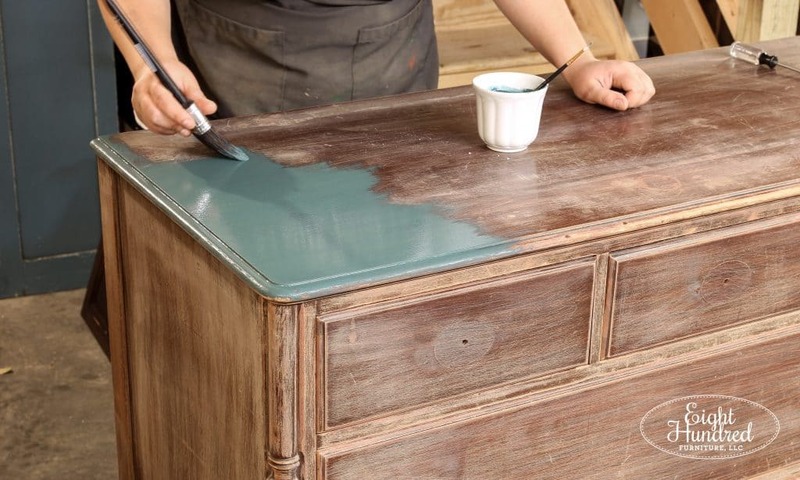 The same applies with MMS Milk Paint. 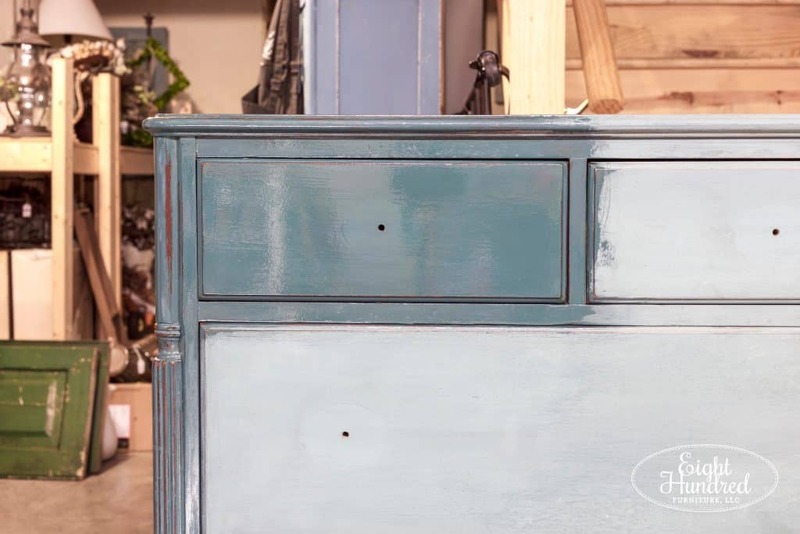 Now I’ve been painting with MMS Milk Paint for over 4 years now and I’m pretty familiar with how it operates and behaves. It doesn’t usually intimidate me, but on a recent project, I had to remind myself to see the entire process through before I made a decision on whether or not I liked the design I had created. 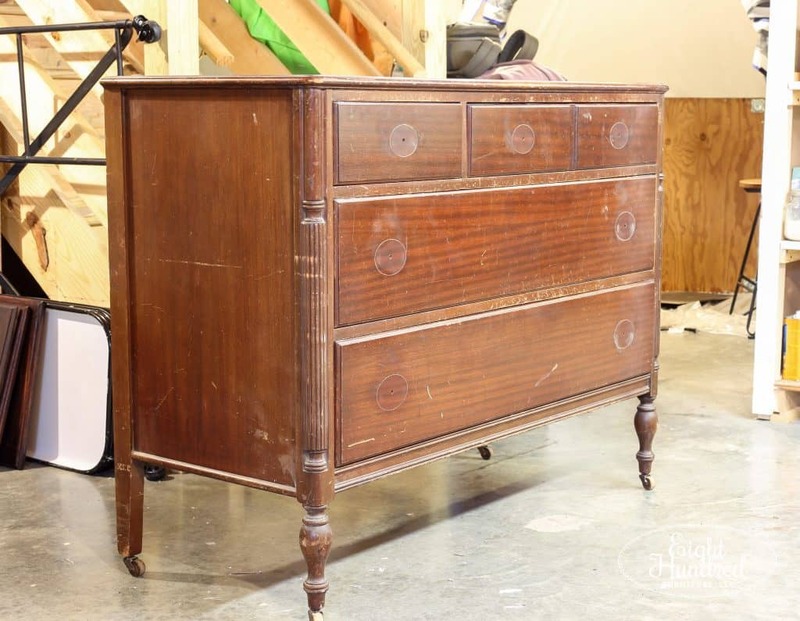 The piece I’m referring to is the vintage 1940’s mahogany dresser I’ve been working on in the workshop this past weekend. I wanted to use a different color other than navy, black, or green. To get my creative juices flowing, I mixed up a custom color of 2 parts Flow Blue, 1 part Artissimo and 1 part Boxwood. It looked amazing in the cup, and it painted out beautifully. 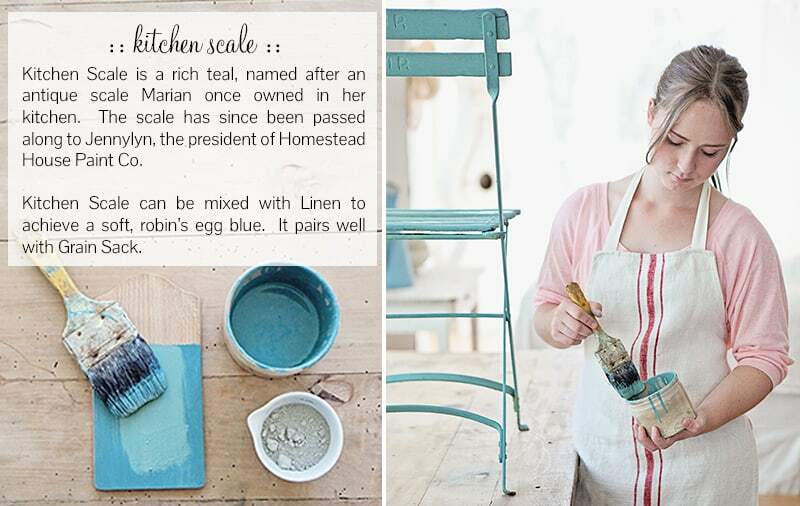 But as it dried, it started to look a bit teal, similar to Kitchen Scale, which is not what I had in mind. I started to worry that the color was going to look more like a mid-tone teal. I was going for a vibrant and rich boho blue that was more blue than teal. That’s why I mixed 2 parts Flow Blue and only 1 part Boxwood. I wanted to keep those greens in check. 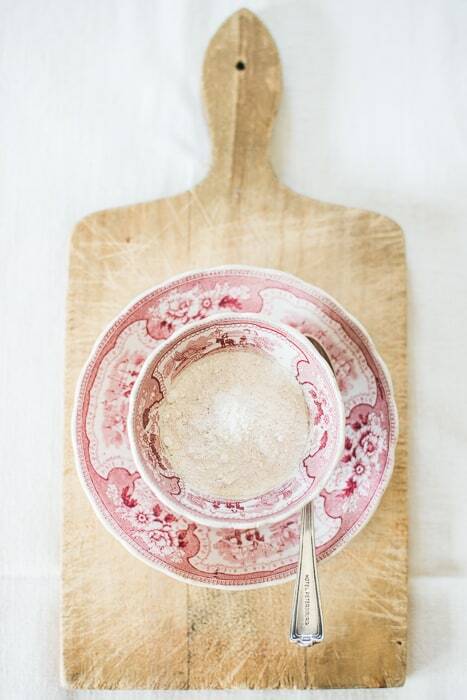 Once I sanded and distressed the piece, things were looking worse. The extra dust made the color look even lighter and my nerves were starting to get the best of me. Miss Mustard Seed’s saying about the foils in your hair was ringing loud and clear in my head, so I pushed through and started brushing on Hemp Oil to seal the piece. As I brushed it on, I breathed a sigh of relief. The color was incredible! See? Even pro’s who have been painting for years struggle with doubt every now and then! The color transformed into the rich and vibrant blue that I was hoping I had mixed up. 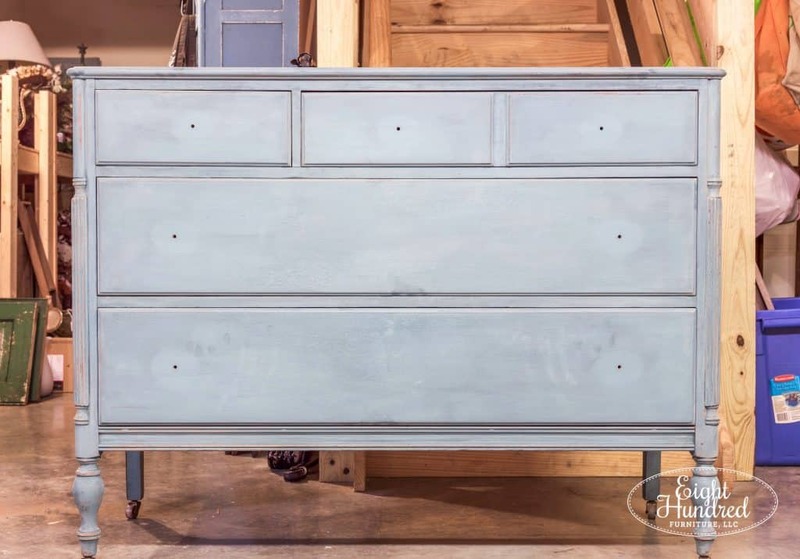 The dusty light teal was gone and was being replaced by the perfect boho blue. Because this piece was mahogany, the wood that was peeking through my distressing was turning a lovely reddish brown, which played so nicely with the boho blue tone. I applied Hemp Oil over the entire piece and let it sit for about an hour while I turned my attention to the handles. 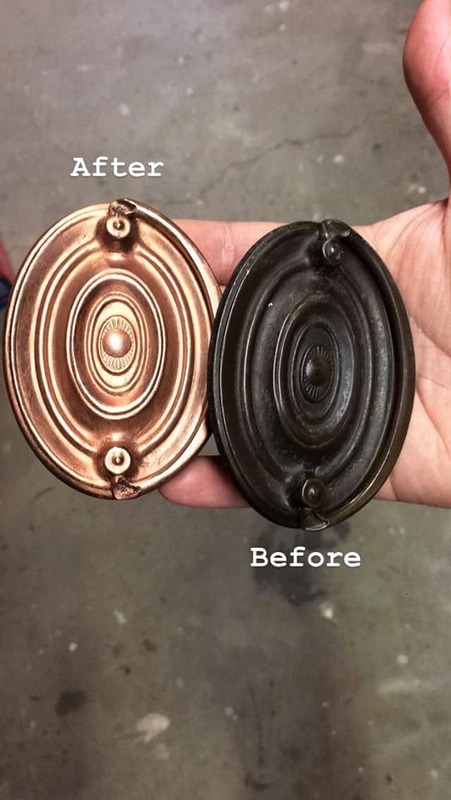 I decided to use “Autumn Gold” metallic wax from Rub ‘n Buff to spruce them up. As I let the handles dry a bit, I wiped back the excess Hemp Oil on my dresser and then installed the new copper handles. The tone of the Autumn Gold looked amazing up against my custom MMSMP color. Now the blotchy patches on the dresser are from the Hemp Oil. 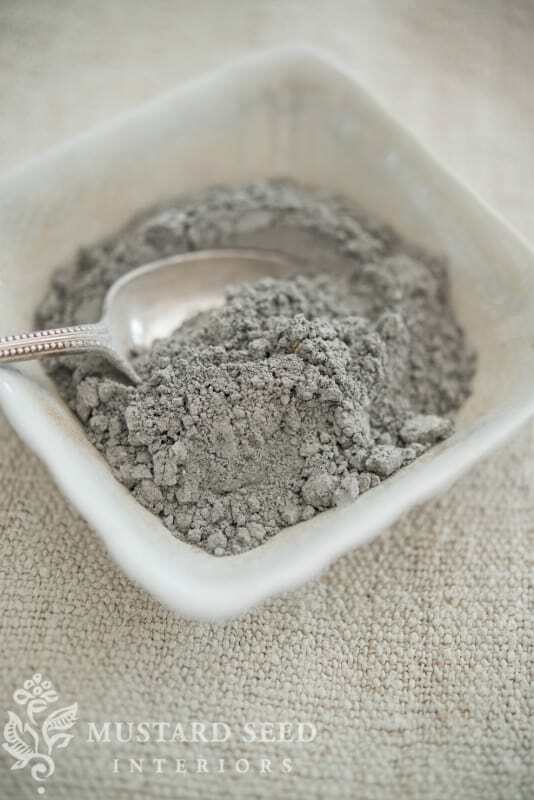 Those disappear as it gets absorbed into the surface. Usually by the next day, they’re gone. 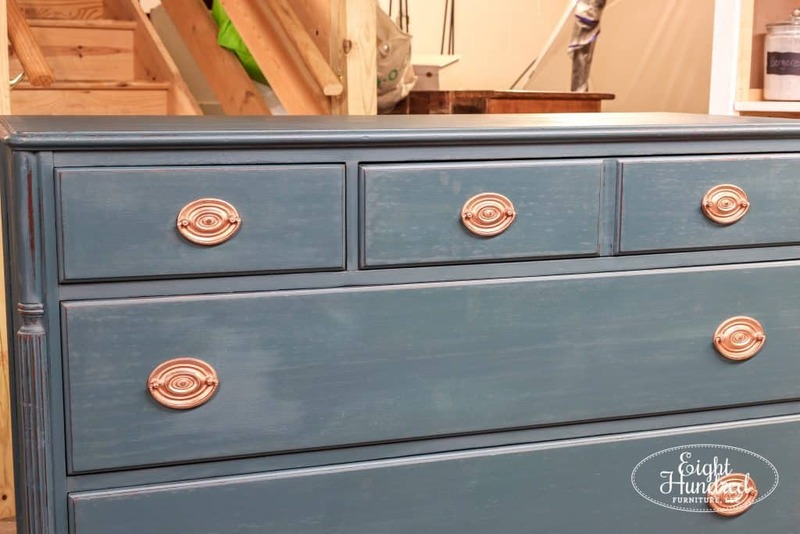 So the moral of this blog post is to see your furniture projects all the way through – especially if you’re using a primitive paint product like Miss Mustard Seed’s Milk Paint. 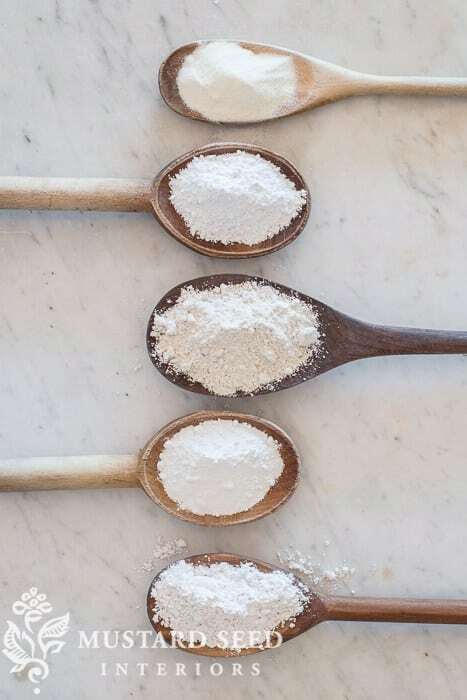 Trust your gut and the products. Things always come together in the end, and you just have to push through the ugly stages that make you question your design choices. I can’t wait to stage this piece and take proper beauty shots to show you all! I didn’t intend to leave you on a cliffhanger, but the duties of the week call. The full reveal is coming soon! If you enjoyed the color that I mixed up, you can purchase the MMSMP products I used from my display at Morgantown Market. I can also ship paint to you if you’re not local. Message me for details!